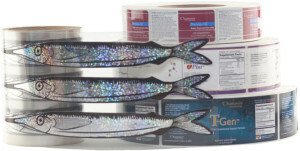 United Label Specializes in manufacturing custom printed pressure sensitive labels. We have been doing it since the industry was born in the early 1960’s. We have developed an expertise unsurpassed in the custom printed pressure sensitive industry. Allow us to take your designs and ideas and turn them into the promotional piece your product demands for the marketplace. We will recommend the proper labeling product as well as the most economical solution to your product needs. United Label has the knowledge you demand and your product deserves. Our staff will deliver the finest custom printed pressure sensitive labels on budget and on time. A custom printed pressure sensitive label that will please and perform! Would you like an easy application of your label to your product? Our custom pressure-sensitive labels stick to most standard products with the simple peel off and placement onto the product. In fact, it’s so easy, you’ll be amazed at how good your product looks, as if it came out of the factory with your label on it. Instead of using heat, water, or a factory press to put your label on the product, our custom pressure-sensitive labels only need one factor: you. By placing a small amount of pressure, the adhesive on the backs of your custom pressure-sensitive labels will bind with your product. United Label does these jobs custom, so that your label will look completely different than anyone else’s. It will represent your company to the fullest, and let your product shine!